One of the things that draws people toward East Nashville — residents and visitors alike — is its unique small-business landscape. Aside of central artery Gallatin Pike, you don’t find yourself overwhelmed with chains on the East Side. Local coffee shops, local cafes, restaurants and clothing stores and more are tucked into small pockets throughout 37206, 37216 and 37207, beaming their own distinct personalities and, more often than not, a welcoming love of all that’s homegrown — restaurants serving local produce, shops selling the work of Nashville makers and so on. That aspect of East Nashville life only got more pronounced, too, with the launch and growth of a couple of neighborhood business incubator spaces. 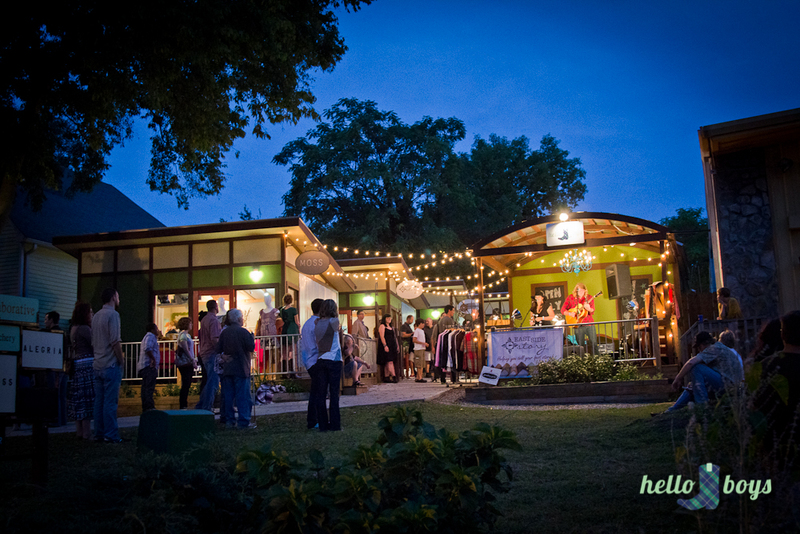 In 2016, East Nashville boasts two well-established, colorful clusters of cozy, affordable spaces for small businesses, located right in the middle of one of the city’s busiest (and fastest-growing) areas. They’ve made it possible for aspiring business owners with ideas and passions to take the leap into making those ideas a reality. And they’ve helped make the East Side more interesting, with a steady influx of locally grown or based brands, from chocolatiers to printmakers. Here’s a quick look at those East Nashville small-business districts, and what you’ll find there, at least for now. The cool thing about their approach: Six months or a year from now, many of the resident businesses may graduate to bigger homes, with new upstart names taking their place, feeding into the continued growth of East Nashville’s fun factor. This retail and restaurant district at Fatherland and 11th in East Nashville started small in 2012, with a mix of cozy incubator business spaces at the Shoppes on Fatherland and an adjacent open-air pavilion, now called The Pavilion East. The mix of upstart businesses got quick attention and steady love, and that helped the District grow — now, there are adjacent spaces at 1100 Fatherland and Fatherland Corner. Between all the spaces, the span of businesses is super eclectic, from clothing to baked goods. And the initial incubator intent is definitely working — businesses including chocolatier Chocolate F/X and clothing shop The Truck started out in smaller Shoppes, then transitioned to larger spaces in the Fatherland Corner building. After a little over a year, local instrument sales/repair shop Eastside Music Supply graduated from a cozy Shoppes shop to the former Logue’s Black Raven Emporium at 2915 Gallatin, at more than twice the size. And apothecary-style tea shop High Garden started in a tiny Shoppe too, moving to a new 2000-square-foot space at 935 Woodland this summer. Check out the full rundown of Fatherland District businesses. Office/retail development The IDEA Hatchery is far from the first positive addition to East Nashville we can pin on Bret and Meg MacFadyen. The two built up and run longstanding art gallery Art & Invention, and are the parents of the East Side’s best-known party, the Tomato Art Fest, too. But by creating this crop of little, modern shops, the MacFadyens helped ensure that other East Side entrepreneurs would have the opportunity to make their mark, too. Storefronts at the Idea Hatchery are thoroughly approachable, rent-wise, in a neighborhood that’s becoming more pricey by the day (rents range from $500-$600 per month). And their location is tough to beat — steps from 5 Points, arguably the busiest spot in East Nashville, with lots of foot traffic. Check out the full rundown of Idea Hatchery businesses. Are you looking for a Nashville home base that gives you steady access to independent shops, restaurants and the like? East Nashville might be your neighborhood soul mate. Let us know if we can show you around the area!